1 Tuner + 1 or more non-Tuner monsters While this card is face-up on the field, each time a Synchro Monster(s) is Synchro Summoned, draw 1 card for each. T.G. Hyper Librarian was once one of the most abused Synchro monsters in the game because of the massive gains a player could get off of him. Generic Level 5 Synchro, good stats, and an effect that brought about the idea of Synchro spam into the game. Doppelwarrior, Junk Synchron, Glow-Up Bulb, and Quickdraw Synchron were some of the many cards in different strategies used to spam Synchro after Synchro to the field while Hyper Librarian was face-up. If you were able to get two Hyper Librarians on the field you could be drawing an insane amount. De-Synchro found some play to get you another draw, but most of the time it was Special Summoning those monsters mentioned earlier over and over to fill your field with Synchros. With Pendulums, Xyz, Link and Master Rule 4 now in play, Hyper Librarian has lost some of its play because of the amount of resources needed to get multiple zones open for the Extra Deck. If you do a lot of Synchro Summoning, this card was a must. While it may be a bit more difficult now, you could still get advantage off of Hyper Librarian with the right cards. For this Throwback Thursday are continuing with our top ten mostly throwback Synchro Monsters. T.G. Hyper Librarian has a very simple effect that can be very easily abused. It’s stats are good being a generic Level 5 Dark Spellcaster-type Synchro Monster with 2400 Atk and 1800 Def. As long as Hyper Librarian is on the field face up, you draw every time a Synchro Monster is Synchro Summoned. More than one Librarian, draw 1 card for each. Draw cards are frequently banned or limited, and this was no different. (I am still waiting for Pot of Desires to get banned.) With only one Extra Monster Zone at the start of the duel, Hyper Librarian has less ways of hitting the field. Fortunately, the effect is not a condition of a Synchro Summon, just put Hyper Librarian on the field, and enjoy the artwork and extra draw power. Today we look at one of the Synchros who came out at the tail-end of 5D’s but was still amazing and was limited for a long time, originally released as a Jump Promo in 2011, we have T.G. Hyper Librarian. Hyper Librarian is a Level 5 DARK Spellcaster Synchro monster with 2400 ATK and 1800 DEF requiring one Tuner and one or more non-Tuners. Don’t need to mention how good the summoning requirements are. Stats are great on a Level 5, Spellcaster is great, and DARK is great. 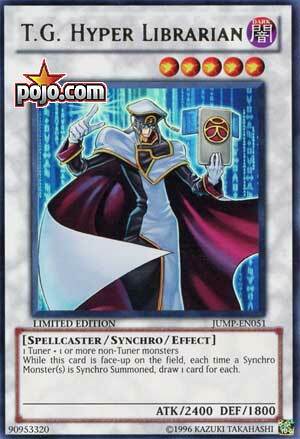 While Hyper Librarian is on the field, each time you Synchro Summon a Synchro monster, you draw 1 card. Spamming multiples of these out can be absurd with the draws on top of you summoning powerful monsters. Many decks are good at Synchro spam, this is why Hyper Librarian was limited for a long time, otherwise Synchros would be too good. Now a days, it is still great for Synchro Spam, but with Link Monsters and the Extra Monster Zone being limiting on you Synchro Summoning, it was safe for this card to come back to 2 and probably 3 eventually. Hyper Librarian is still great for the Synchro Spam decks that still exist. Links won’t powercreep this card completely. In its prime, it was probably closer to 5/5, but now it is still great. Art: 4/5 T.G.s have solid artwork overall. This takes me back. T.G. Hyper Librarian was well used and abused for a few Formats back in the day. A Spellcaster (which might be a better asset now with all the support released between then and now) and a 2400 attack body on top of a very easy to bring out Level 5 Synchro Monster. He was incredibly splashable, in most of the Tier 1 Decks at the time, because of how easy it was to generate advantage off him. Gaining a card each time a Synchro Monster is Synchro Summoned, and ANY that is, you or your opponent, means if this guy is out on the Field even for just a short time, you’re likely going to capitalize off it, in a big way. Two cards from Librarian equal the (likely) two you used alone just for this Synchro Summon. Every thing after that is just bonus advantage to the player. He still sits at Semi-Restricted today (and Limited I believe in the OCG) but he’d still be an asset to any Deck that could fit him I believe. Use, abuse, Draw, and enjoy. Art: 4/5 Nice, but doesn’t earn a 5 compared to what we’ve seen so far, comparatively. This card gave Synchro-based combo decks the draw power it needed to complete its combo’s. Executing Synchro-based combos in a mirror match does require skill and attention to detail overall, though to non-Synchro players at the time, TG Hyper Librarian was basically power creep (especially with no particular limit to how many cards can be drawn from its effect. Librarian did become less powerful over time as power creep in general went up, but also because cards like Spore and Dandylion got hit on the ban list.